Everything needs water. Without water, nothing can happen. For communities without water, whether it is dirty or clean, someone must go out early or late into the night to bring water back so the day can begin. It is a child's job, typically the girls, to get water for their family. What seems like a simple task will take up most of their day and energy. They leave home with empty 5-gallon cans beginning their 2-3 mile journey. Quite the way to spend your morning. Without walking with a companion, many children risk being attacked by people. Once they make it to their water source, they have to fill up their 5-gallon can. The water tends to be muddy, murky, and shared with animals. Once the 5-gallon can is full, it weighs 45lbs. That same 2-3 mile walk just became harder and troublesome. Carrying 45lbs is no easy feat even for an adult. The pressure of the water constantly shifts as it is balanced on top of the child's head. Small breaks are needed every few minutes from the exhaustive process of carrying water. Once they make it home, they must begin to use that same water to cook, clean, and wash. Even if that water is dirty and might make someone sick, they must use it for their day. After all of these chores, children can leave to go attend school. Many will become distracted or fall asleep from being exhausted of carrying the weight of the water. This all can change, with an accessible clean water source close to their home. This is where MissionCleanWater comes to help. Its the Dry Season. What Does That Mean? Depending on where someone lives, they typically have two or four seasons. If they have four seasons, then there is a well-defined Fall, Winter, Spring, and Summer. The weather changes each season bringing hotter and colder temperatures. If someone has only two seasons, the seasons can be described as wet and dry. For some, the dry season can mean life or death. During the wet season, the sun's solar radiation is not overpowering. Each day, some sort of precipitation will fall, other days being more intense than others. From the rain, all of the aquifers are recharged, the rivers are flowing, and water sources are plentiful, clean or dirty. During late October the dry season begins and continues until late February. During this time, not a single drop of rain or moisture will fall. Water resources quickly dry up. Community shallow wells run out of water and go dry. Since there is no rain, the wind picks up all of the dust creating breathing hazards. During this time, the environment and social settings change drastically. The search for any water source begins. During the dry season, the water wells do not have to go dry and can work year round. By fully understanding the technical capabilities of each borehole, the water resources can be maximized for the most use. Community members can be taught how to maintain and take care of their wells to avoid long-term breakdowns or abandonment. Together, we can create a clean water resource that works year round. The end of 2018 is around the corner when annual giving is at its highest. To promote holiday giving, companies have created incentives that can double or triple any size donation. By looking at all of the resources available, anyone can make an impactful holiday season. When is the best time to get the most out of my donation? November 27th and while online holiday shopping. November 27th is Giving Tuesday, or the "Black Friday for charitable giving." Companies have incentives and free resources to promote annual giving. This is the day where your donation can easily be tripled and here is how. On Nov 27th, Facebook is hosting a matching campaign where any donation made to MissionCleanWater will be doubled. As long as the donation is made on Nov 27th between 8am-11:59pm EST and is done through Facebook, the donation will become doubled. All gifts made through Facebook come with a receipt for taxes and proof of donation. Most employers have their own charitable giving program where they will match any donation an employee gives. Use that receipt to show your employer and they will match your gift tripling your contribution. In a day, a contribution can go from $100-$300, $1,000-$3,000, $1-$3. This is the time of the year to be jolly, we can make an impact together. Last week was a success from all of the volunteers and help we received. Our field partner, Andrew, was visiting from Uganda and our Virtual Run was slowly coming up. In the end, the community came together to make Andrew feel welcomed and to have a record number of people running for the Virtual Run. Andrew's original reason to travel to the United States was to attend the Clinton Global Initiative conference in Chicago for his NYU masters program. After the CGI, he spent 2 days waiting for buses to arrive in Newark, New Jersey. We picked him up, got him some real pizza, and settled into his new home for the next week. The first thing we did was get organized and create a game plan for when he returns to Uganda. Our goal is to begin the next phase of the project in January. For this to happen, we need to start looking at all of the data collected and consulting drilling contractors to begin obtaining the groundwater we want. Andrew traveled to and from NYC doing small talks and giving people updates on the progress of MissionCleanWater. The one thing that amazes him the most with the USA is the diversity of food. In Uganda, unless you are in a city, it is hard to get anything different than eastern African food. Still delicious, but Andrew had fun trying American BBQ, shellfish, Spanish food, taste testing bakery sweets, and the variety of soft drinks. When not doing work, Andrew spent his time clearing the shelves of thrift stores to bring shoes and shirts back for his wife, kids, and the neighbor's children he looks out for. As each day passed with Andrew, the Virtual Run became closer. 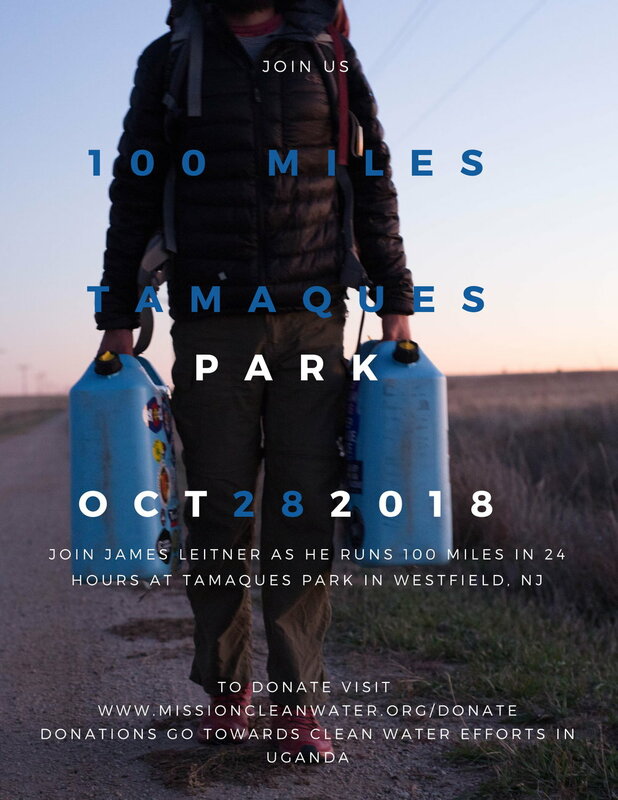 James spent each day with Andrew, but his mind was focused on running 100 miles. He had a nutritional plan created, an expected mileage for each hour, and all the gear to be successful. All he had to do now was be at the start line alone and at midnight. Across the country, runners will be participating in the Virtual Run, so James would never be alone. An 11:30pm alarm woke him up to start a long day, James popped a bagel in the toaster oven while getting changed, and drove the 5 minutes to Tamaques Park to begin 125 loops around the park. He started off strong, sticking to his attended pace but was quickly covering too many miles. The added benefit of going too fast meant he could slow down later and do a few slow laps with his family and friends. At 5:30am, the first group of runners came to join him to help him reach his distance. Showing no signs of issues or fatigue, James made it halfway in 10 hours. He started to cover less distance each hour but was not concerned as long as he kept moving. His legs were becoming heavy, but the option to stop for more than a few minutes was not in question. The first body function to go south was his digestive system. At loop 84, he was not eating the way he should. The sugary flavor of his electrolyte water was unappetizing, he craved a real meal Not only was he feeling sick, but his emotions also started to swing as he tried to avoid hitting any walls. The Moms Run This Town Union County Running Club kept him great company for his rough patches. Even though while engaging in conversation he was loopy and not finishing sentences properly, his mind drifted away from the pain for a bit. For anyone that has completed endurance distance before, even with one mile left, you could quit. Only 17 loops separated James from 100 miles but he was having a hard time standing, talking, and focusing. The countdown continued until only 3 were left. The wonderful runners with him recognized his pain and suggested he finish the last three solo. For the first time, he put in earphones, felt completely euphoric and finished at a pace similar to his first hour finished in 20 hours and 15 minutes. The moment of finishing and collapsing marked the end to a successful Virtual Run. There really is no reason to set an 11:30pm alarm to start your day. Some might if they have a night shift or want to witness the countdown for the new year. Maybe its when your ultramarathon begins. Well on October 27th, a painful 11:30pm alarm will wake up one man, in particular, James Leitner. This alarm will signal the begin of a long, wet, painful October 28th as he gets to his own start line to begin running 100 miles in 24 hours alone. Better to read his words directly. "My alarm will go off at 11:30pm. I will eat a wholesome breakfast of oatmeal, granola, and a banana on my way to Tamaques Park in Westfield, NJ. My car will be parked with enough cold weather gear to hike the Himalayas and enough food to feed an army. At midnight, Oct 28th, I will begin my 4.5 mph pace of jogging and walking 125 loops of the .8 mile running track. Each hour consuming 20 ounces of water and 300 calories. There will be no avoiding the mental and physical strains my body will be going through. There will be no avoiding the ran and being in wet clothes and shoes for hours. Everything is going to hurt, my mind is going to want me to quit, but all I can do is keep moving forward. Each mile will help children and women gain access to clean drinking water. That is all I want in the world." The more people that visit him, the better he will do. To join him, visit the makeshift aid station set up in front of a Mazda 3 in the main parking lot by the tennis courts. To donate towards his run, visit www.MissionCleanWater.org/donate. During our field assessments in August and September, we identified two communities that need the most help with clean drinking water. Agirigiroi and Akuoro are located in the Serere district of Uganda and do not have a clean water source. To make their situation worse, the dirty water sources they have will go dry during the dry season. When there is no water, women, and children will begin walking up to 4kms missing school and work to try and find water. A clean water solution has to be created soon because both communities will not be able to last through worsening dry seasons. During our field assessments, we were able to meet with each community and learn what they want to be accomplished. A coordinated effort between the local water district office, environmental consultants, and ourselves started to finish the first technical part of helping. We needed a thorough hydrogeological report completed and to begin community education on water and sanitation issues. On October 13-15, our field team and an environmental contractor traveled to visit Agirigiroi and Akuoro to begin geological and educational field assessments. The purpose of this fieldwork was to work with the community and determine the best location to search for groundwater. While the contractor was using their methods to locate groundwater, our team and the local water district office was working with the community to teach them what was happening. They learned about the importance of sanitation practices and using a groundwater resource carefully. The Water User Committees worked with the contractors providing help in any way they could. The contractors were able to locate the water table and determine the best locations to find groundwater. All of the landowners gave their word publically that it is okay to drill on their land as long as it provides their community with clean water. A final report will be prepared to share the local water district offices and the contractor's thoughts about how to proceed. The best thing to do now is to keep the community informed and get ready to move forward with getting groundwater.